Yawn stretch, scratch, repeat. Monday has come again, and on a holiday weekend at that. I'm enjoying my long weekend, how about you? 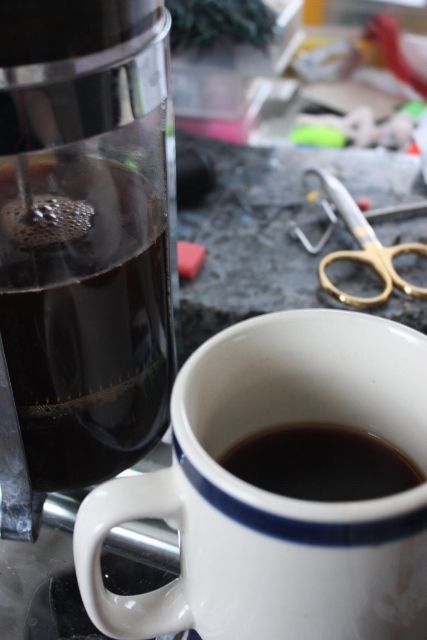 Let's have some coffee. 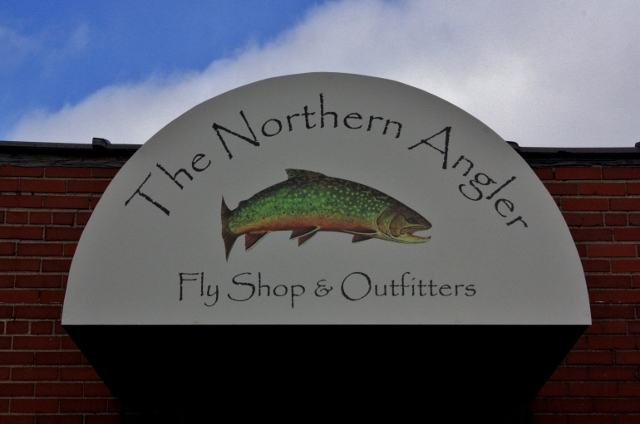 Well, perhaps the big news this week is the opening of a new fly shop in the area- Boyne Outfitters. I stopped in Friday after work- they had been open a total of 4 hours. Ethan Winchester has put together a good basic inventory of gear and flies with more on the way. I work in Boyne City now, and it's nice to know that if I don't have time to tie I can pick up some Backstabbers or BWO imitations on my way home. Ethan has also kept the pricing at normal levels. He's carrying Redington and Sage rods and reels, Simms waders and boots and a selection of lines, leaders and tippet material from RIO. Ethan says they'll expand the product lines and fly selection as the seasons and hatches change. They plan to add tying materials when fall rolls around and guys think about tying again. Boyne Outfitters is located in Boyne Mountain Resort across from Kilwin's. You can call them at 231.549.6064. I got to fish on Saturday on my local brook trout water. Conditions were extremely tough, with very low, clear water. If it's this bad now I hate to see what July will bring. Still, the fish were out, often sitting in inches of water. With no visible hatches going on and clear bright skies I just threw a small caddis all day, and this seemed to fit the bill. I caught about 20 fish, most were 5-7", but still fun on a 3 weight rod, and they are colored up beautifully. I didn't carry my camera, so you'll have to settle for phone shots. I had to cover a lot of water for my fish, and spent a lot of time just hiking upstream, covering twice the distance I normally would in an afternoon. As the wind rose I spent more and more time retrieving my fly from the tag alders. It took me more than an hour to walk back to my car. The other big news here is the wildfires. So far about 25,000 acres have burned in Michigan's Upper Peninsula, in the area where Ernest Hemingway fished and wrote about. 3400 acres have burned in the Seney Wildlife Refuge, and over 22,000 acres have burned in the Two-Hearted River area. It's being called the Duck Lake fire. As of yesterday they had only reported six structures burned, but according to CMU Public Radio this morning over 30 homes and cabins have burned as well as over 50 other structures. News reports say that the venerable Rainbow Lodge at the mouth of the Two-Hearted River was destroyed. With dry conditions and no significant rainfall for that area in sight, it may take awhile to contain this one. The Upper and Lower Tahquamenon Falls parks and the campgrounds are all closed due to the smoke. The fire itself is said to be about 7 miles west of the Upper Falls, so Tahquamenon may not be out of danger. The DNR website has full coverage of the fire, maps of the area affected, links to photo albums, and up to date state-of-emergency and burning ban information. Go to http://www.michigan.gov/dnr to find out the latest. I feel for everyone affected by this fire. On a more positive note, Michigan's next Free Fishing Weekend is coming up in two weeks on June 9 and 10. No licenses will be required that weekend, so if you wanted to try your hand at fishing, or don't go enough to want to buy a license, this is a great time to get out and hit the water. Be advised that all other fishing regulations, limits and seasons apply. Speaking of fishing, this post has gone on long enough. With warm temps and a bit of overcast this morning, it looks like a perfect time to go swing some soft hackles. Enjoy the extra day off and have a safe drive getting home. Me, I am home, so I'm going fishing. Yawn, stretch, scratch, sniff, er... I mean repeat. What day is this? Did I sleep through a couple of days? Did I Rip Van Winkle the last two weeks? No, I took a brief vacation from blogging, thus the drafty sound around here. Sometimes I need a break and I haven't done much fishing the last four weeks anyway. The only reason I wrote my Yellowstone post last week was because an idea popped into my head and it was kind of fun. Plus they're giving away so much stuff. If you haven't entered the OBN/TU/Simms/YPF writing contest you should get to it. Anyhow, I fished all weekend and came home refreshed and ready to write Monday Morning Coffee, and my internet was down. After several days and a call to tech support, it turned out that a wire on the phone box outside had come loose. A little work with my Leatherman- problem solved. Did I mention how good the coffee is this morning? So here's the latest. I drove down to Traverse City Friday night, picked up two BOA repair kits in town, then drove to a state forest campground, fixed my boots and set up camp. Alex Cerveniak took a break from his walkabout to join me. 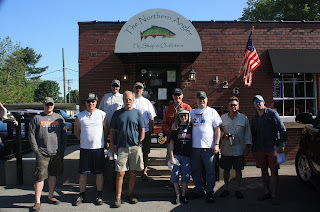 Saturday we participated in the carp derby put on by The Northern Angler. About 14 brave souls showed up. It was a very hot day, with temps close to 90 degrees, but it was pleasant on the water. Despite unseasonable warmth in March, it has been a bit of a cold spring, with lots of frosty nights up until this last week. The result is that the water is still cold, and the fish were holding offshore instead of coming up onto the flats. We did quite a bit of driving around to find them. We finally found them in West Bay near downtown- we actually fed a meter in order to fish. We caught ten smallmouth bass between us. 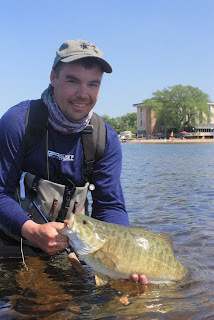 Alex got the numbers, out fishing me 6-4, but I made it up in size, catching not one, but two 20" bass, gravid females that weighed well over 5 pounds, monsters in the world of smallmouth. These were my biggest smallmouth on the fly, though I've caught several that were much bigger on conventional gear in years past. It was a fun day, and Alex and I were the only ones who caught fish. 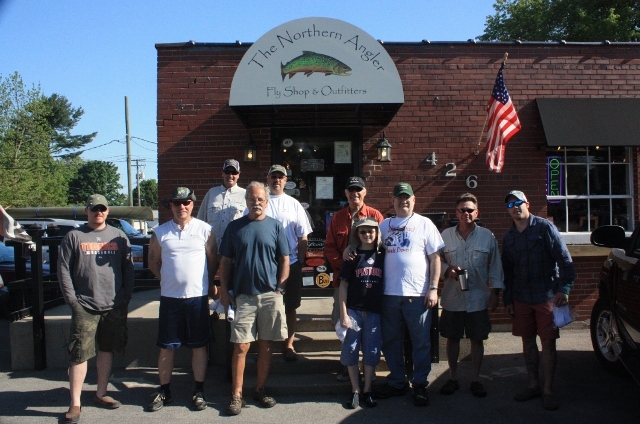 I want to the thank The Northern Angler for putting on such a fun event, and Ben Hunting of Sage for putting up some great prizes. Sunday was even hotter, and still feeling stoked from Saturday, I went and hit my local flats. The bass were there in force, and I caught dozens. 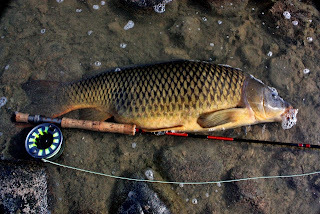 The big fish haven't moved inshore yet, and I didn't see any carp, so the best fishing is yet to come. Still, it was a different scene from Traverse City- no houses at all, very few anglers, just me, the wind and surf and seabirds, and miles of lagoons, back channels, rocky shoreline, and schools of fish that I sight cast to in the crystal clear water. Well, I have to run to work. This is just a quick post to explain the silence here at FR. I have several good things to come so stay posted. I have never been to see you. Ever. Don't know if I ever will. I hear you have good fishing there. Sounds interesting. I haven't been to see you, but I've watched you on TV. And I play a fly fisherman in real life. I hear that Yellowstone Lake has a little problem with lake trout. I feel your pain. Lake trout are native here in the Great Lakes, and we kind of like them. Especially the siscowets, a red-fleshed variety that is highly prized. Lake trout smoke up right nicely. Maybe I come from the same side/other side of the fence. You see, we here in Great Lakes Land have had our share, no, more than our fair share of invaders. Brown trout. Rainbow trout. Lampreys. Alewives. Smelt. Salmon. Gobies. Zebra mussels. Quagga mussels. The list goes on and on, while our native species have dwindled to a shadow of their former glory. The Great Lakes used to have a major commercial fishery that seemed boundless, and freight cars of fish were shipped to markets in Detroit, Chicago and New York. Then the Welland canal connected the Great Lakes to shipping traffic from the Atlantic. First came sea lampreys, which found an easy meal in the slow moving lakers, decimating them. Then the alewives. These bred out of control until they died en masse, windrowing the beaches with tons of rotting, stinking fish. Salmon were introduced to control the alewives. They did this, and the current world record coho salmon comes from Michigan, not British Columbia or Washington. They also displaced native brook trout and introduced a lot of bad behavior on the part of anglers. Smelt, introduced to Crystal Lake as a food source for trout, also decimated native fish populations, as they are a predator that feeds voraciously on fish eggs and fry. About twenty years ago ships from Asia discharged their ballast water here, releasing zebra mussels, quagga mussels, and freshwater gobies. The zebra mussels are ubiquitous now, and they filter so much water that the lakes are much cleaner. The downside is that their tiny, razor-sharp shells litter the beaches in many areas, necessitating beach shoes, and they have done billions of dollars in damage to infra-structure. The invasion continues. Right now, one of the biggest invasions in the natural world is underway- Asian carp, with the ability to homogenize our waters, and make boating unsafe, are on the verge of invading the Great Lakes. Unnatural waterways connect the Great Lakes to the Mississippi basin, already infected with these pernicious species. We're just hoping this nightmare never comes true. The Army Corps of Engineers and the current presidential administration continue to oppose closing the links that connect the Great Lakes to disaster. Which brings me to Yellowstone. I love cutthroat trout. I love native fish and intact ecosystems. I want to fish there, I want to catch cutthroat, I don't want to catch Lakers. That's what the Great Lakes are for. I feel your pain Yellowstone- to see your native fish wiped out and endangered by an introduced invader. To see your heritage plundered. Our fish are more than just cutthroat and lakers. For instance, we had grayling. Not anymore. They were wiped out by indiscriminate fishing and logging. Our lakes hold not just whitefish, but several species of lake herring, ciscoes and pin herring, many of them seriously reduced in number, a shadow of the fishery they used to be.. Our lake trout are back, but we're happy about that, they're native, and not endangering any cutthroat here. Ironically, the introduction of Asian gobies seems to have helped the lake trout as well as the smallmouth bass, a food source that suits them. Good times. Yellowstone- save yourself. Kill this lake trout scourge. Do whatever it takes. Trap, shoot, fish, gillnet, kill, kill, kill the lake trout. Wipe their memory from your lake.We will preserve it in our waters, our right, our responsibility. Save your precious cutthroat. 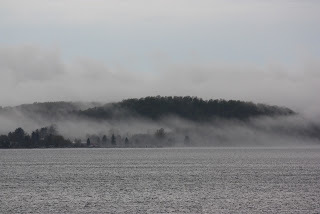 I share this info about the Great Lakes as both a cautionary tale and a glimmer of hope. First of all, no one is going to open a shipping canal to Yellowstone Lake, so that should spare you several dozen invasive species. With only one fish species to focus on you should be able to makes some progress. I doubt you'll ever completely eradicate lakers, but with some hard work, millions of dollars and some luck you should be able to knock them back a bit. The Great Lakes are a shadow of their natural glory, but you know what? The fishing is still pretty good here. You should be able to exert enough pressure on the lakers to bring the cutthroat trout back to viable levels. It will take hard work, a lot of money and an ongoing commitment, but it's doable. One day I will hike the back country of Yellowstone and catch native cutthroats. I've done everything else I've wanted to do, so why not this? Lakers won't picture in this. Running streams, mountains, high country dotted by coyote crap, the mountain flowers fertilized inadvertantly by digested voles. Bison grunting contentedly, or perhaps menacingly. Maybe I'll get eaten by a grizzly bear, excreted into a stream, devoured by stoneflies and fed upon by cutthroat trout rising to the salmon fly hatch. This would make me happy, a happy end to all my vagabonding, my own circus ride through a multitude of digestive tracts. Hopefully I'll live, catch some fish, and lay down on the banks for a nap, smelling the sweet grass and flowers in that rarefied air of America's first National Park, my hands smelling of cutthroat. Yawn, stretch, scratch, repeat. It's Monday- must be time for coffee. Coffee. Sweet brew of the gods. How I love thine dark self, thy aromatic pleasures, the lift thou giveth me each morning. May His light always shine upon thee. Sip, slurp, glug. Oh black siren. Keep singing my song, ever my roasty companion. It has finally started warming up around here, and last week gave us our first frost-free nights of the year. Heavy rains blew out the rivers in the middle part of the state, though they're not bad here. My fishing has been seriously cramped by a broken BOA cable on my boots. I'm itching to get out and chase brook trout again. I have lots to do at home, and it is morel season now, one of my few distractions from fishing. 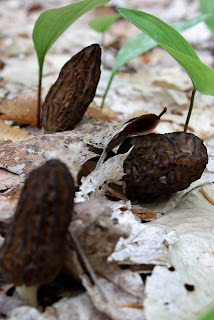 I went morel hunting Friday night and found a couple of pounds, then went Saturday and found a couple pounds more. Your first batch of morels MUST be fried in butter and eaten with salt. That's it. You have to enjoy them on their own, that rich aroma and flavor engulfing you once again. After that you can deep-fry them, make soup and serve them over steak and trout. But those first few morels must be enjoyed on their own, a spring delicacy that can't be replaced. I did get an invitation last week from Jeff Johnson to come and fish Brookhaven Lake, his private lake in Clare County. I'm not normally a private water kind of guy, but had reason to head south and fish with him on Sunday. I'll share it in a post later this week. We caught some nice brook trout and I had a good time. On May 19 Alex Cerveniak and I will be participating in The Northern Angler's Carp Derby. We're going to try to catch some carp on the crystal clear flats found around Traverse City Michigan. If you have ever wanted to try your hand at this then come on out. It's a fun outing, and Brian always has fun prizes to hand out at the end. He'll be showing the Fly Fishing Film tour on Friday the 18th. You can call The Northern Angler at 231.933.4730 to score tickets or sign up for the Carp Derby. Well, it's one of those days when I don't feel I have much to say. Have a great week, and make sure you get outside and enjoy spring. Why Michigan Needs to Maintain Strict Limits in Coastal Waters of the Upper Peninsula. As I’ve publicized before, I’ve joined an adventurous group of gentlemen to go to Isle Royale National Park and fish for and document the endangered Coaster brook trout. Except that they don’t exist. I had always taken the answer to that question for granted- this is Michigan, those are our fish. As a budding amateur journalist I was intrigued. After all, I’ve caught 18” brook trout through the ice on Lake Michigan near Petoskey. DNR biologist Neal Godby once referred to the big brook trout they net incidentally in Burt Lake while surveying walleye as “Coasters”. And the USFWS people I had run into at the lamprey weir on the Little Carp river in the Straights of Mackinac had told me of the large brook trout they catch incidentally in their traps there. Could these also be coasters? A couple of people who I had mentioned this to knowingly suggested that I don’t know what a real coaster is. Perhaps they’re right. It could be that they don’t know either. So I contacted DNR biologist Neal Godby and asked him what information the DNR had and the ream of material he sent back was astonishing. Long story short- there are no Coasters. To be clear- Coasters occur as a phenomenon, but they are not a genetic subspecies or type. Even more amazing was to read that all of the northern Great Lakes brook trout are genetically identical, even the Nipigon fish. While Eastern brook trout had been stocked at one point in some streams in Michigan, solid evidence shows that all of Michigan’s cold streams connected to the Great Lakes were colonized by brook trout after the grayling were extirpated by fishing and logging activity. We still have our native fish. And yes, that would make those extremely rare large Lake Michigan or Huron brook trout “Coasters”. want to catch fish like this? Don't keep ten of his babies. The fun thing about being a sportsman in Michigan is all the intrigue and peril. I knew that if I only shared the DNR’s research and chosen studies I would be ridiculed. “Don’t you know the DNR is all politics?” “They just don’t want another Endangered Species to manage, and so they cherry picked their studies to shoot down the designation”. Those arguments could seem to have some validity. After all, the information shared with me stated that the US Fish and Wildlife Service had applied for ESA protection for Coasters. But what stood out to me was that they had lost. So I contacted the Fish and Wildlife Service office in Ashland Wisconsin to find out what they had to say. I had a really nice conversation with biologist Henry Quinlan. It turns out that their ESA protection request was procedural. They were petitioned by private groups to have Coasters get ESA protection. They are required by law to jump through the hoops when petitioned and so they did. Except that USFWS research agrees with that cited by the DNR- there is no evidence that Coasters exist as a genetic strain. None. To the contrary, the evidence suggests that Lake Superior is the perfect home for brook trout to reach their full genetic potential. Put them in some cold but miserable brook beset by otters and mink and they might live to three years and ten inches. Put them in Lake Superior with lots of deep water to escape to and tons of chow and they can live for several more years and become the sumos of their kind. When you add in the overwhelming genetic evidence the answer is clear to me- Coasters are brook trout in their perfect environment. 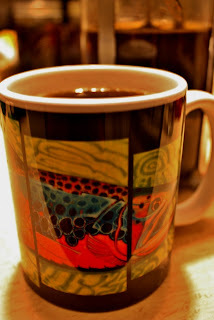 And this leaves me even more hopeful- as long as we have brook trout, there will always be Coasters. So let me be clear. Coasters do not exist, not as a genetic strain. Coasters do exist as a phenomenon of Lake Superior, the ultimate brook trout pond. This distinction is important, as it shifts the focus (and resources) from trying to identify and save a genetic strain that doesn't exist, to preserving habitat and promoting regulations that will foster strong Coaster numbers once again. Michigan has other giant brook trout producers, and they are no Lake Superior. I would die to catch one of these fish. I’m not at liberty to name these lakes, but they do exist. Fish in the 3-5 lb. range are possible. 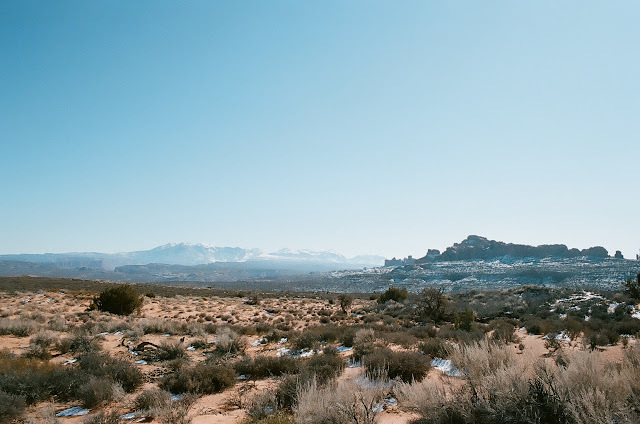 Book a trip with Brad Petzke and then take a walk with him. He’ll show you some fish. The fact is, if you toss brook trout into any large body of water with ideal temperatures and a good forage base, they can start to resemble the brown trout you are used to. They get big, mean, fat, jowly, and oh so catchable. The point being, give them food and space and they will grow. If anything, Coasterism is a testament to the genetic plasticity of brook trout. I think that there has been a rather nostalgic idea here of what Coasters are- our salmon. That they live that lifestyle, being borne in natal streams, smolting and heading to Lake Superior to feed and grow, then returning to the gravel they were born in to complete the cycle. None of the scientific evidence supports this. The biggest frustration in the Hurricane river study was that once those fish dispersed, they almost never came back. Ever. Coasters don’t smolt, seem to completely lack a homing instinct, and many spawn on off-shore gravel. So instead of trying to preserve our piscatorial Sasquatch here’s what I propose. Let’s raise the bar here. For instance, certain groups would like to see the catch limit in Michigan’s UP raised to ten brook trout, from the current limit of five. This is absurd. To be fair, proposed creel limit changes would not affect streams that already have tighter restrictions, but what about the dozens of creeks and non-restricted rivers? If you want Coasters you had better not be cleaning your streams out of seed fish. Michigan has set the minimum size limit on all coastal waters of Lake Superior to 20 inches with a limit of one fish and this is a good start. Canada has enacted similar rules- one fish per day that must be at least 22.5 inches. When I was up in Nipigon last year they spoke of catching coasters as routine. Henry Quinlan informs me this was not the case 15 years ago. Some locals fought these rules, but in the end good science prevailed, and now they are catching fish again. Michigan is a great state, with a proud heritage and a tremendous fishery. It is my dream to stand on a beach in the UP and catch a Coaster some day. I guess my argument here is less about whether Coasters exist than not wanting to see us take a step backward by enacting the proposed ten fish limit in the UP. The days of “living off the land” are over. They never existed, which is why fish stocks got so depleted in the first place, and why fish and game laws were enacted. I enjoy eating trout, but I’ll never stock my freezer with them again. I enjoy them fresh as a delicacy, not as something that is going to get me through the winter. If you support the ten fish limit don't complain about the lack of Coasters. Enough said. I’m going fishing.